British Transport Police (BTP) have renewed their appeal for information or witnesses to a violent attack and theft on a train between London Waterloo and Putney, via Wandsworth. The incident received extensive media coverage when the appeal was first issued earlier this year, also featuring on BBC Crimewatch, but officers are yet to identify the perpetrator of the attack. 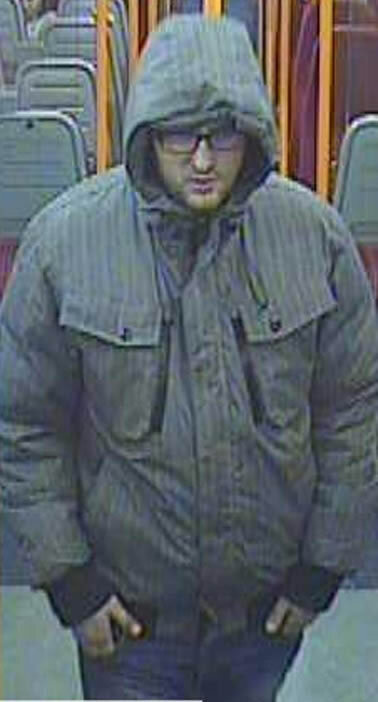 Today, officers have released new images of a man who was on the train at the time of the incident, on Saturday April 13th, and have urged anyone who knows him to contact police as a matter of urgency. Detective Constable Gary Bellinger, from BTP Waterloo, said: “This was a horrible and violent attack on a young man simply making his way home, and left him with a broken cheekbone. “I am enormously grateful to the media for the widespread coverage this incident has already received, and we are now redoubling our efforts to identify anyone with information, particularly the man pictured. The victim, a 22-year-old man, was returning home after a night out in central London, with the offence happening around 5.45am. He was sitting in the front carriage of the train when a man he didn't know approached him and punched him on the left side of the face, causing him a broken cheekbone as well as bruising and swelling to his face. The victim’s Blackberry phone, worth £300, was stolen during the assault on the 5.33am London Waterloo to Putney service, as well as his wallet, containing ID, credit cards and a small amount of cash. It is believed the suspect left the train at Putney, where he went to McDonalds and used the victim’s credit card to purchase food. Bizarrely, he then went to another branch of McDonalds in Fulham, where he again used the victim’s card to pay for food. As a result of the attack, the victim suffered a broken cheekbone and required extensive hospital treatment. Anyone with information is asked to call British Transport Police on 0800 40 50 40, text 61016 call or Crimestoppers, anonymously, on 0800 555 111. In all calls please quote log B7/LSA of 03/05/13. Carry your handbag securely in front of your body. Keep all fasteners closed and facing inwards. Carry wallets, mobiles and iPods in a secure inside pocket. Mark all valuable property (iPod, mobile, etc.) with your postcode, house number/name. This can be done with a permanent marker, UV marker or engraving. Keep your mobile out of sight when not in use and set it to vibrate to attract less attention. When using your mobile in public, never disclose personal information such as credit card details or address. Take note of your mobile’s IMEI number (enter *#06# to find yours). This will help your service provider block its use should your phone be lost or stolen. Be alert, walk upright, briskly and appear confident. To boost your sense of security when travelling at night, travel in a busy carriage or close to the driver or guard. When on stations look for CCTV cameras and try to stay within view. Avoid short-cuts and dark alleys, especially at night. Register your mobile with a location service, for example ‘Find My iPhone’ for Apple devices or one of the many others available for other smartphones.